How do I apply sunscreen correctly? Should I use physical or chemical sunscreens? Will a base tan protect me from burning? What sunscreens do the experts wear? Even if you don't read this entire article...please take one thing away: Sun protection is a non-negotiable. Find a sunscreen you like to wear and wear it every day. Garrett Forrest, PA-C at Bay Area Cosmetic Dermatology demonstrates the correct amount and method of sunscreen application. Higher SPF #'s = More Protection MYTH! Using simple math, most of us figure that SPF 30 is twice as effective SPF 15, right? Wrong! According to the American Academy of Dermatology, there’s really just a 4% difference - with SPF 15 blocking 93% of the sun’s rays and SPF 30 blocking 97%. We recommend using a sunscreen with at least SPF 30, but keep in mind, the higher SPFs block only slightly more of the sun’s UVB rays and there is no SPF that 100% blocks all UVB rays. Also, don’t assume a higher SPF means your sunscreen lasts longer. High SPFs allow you the same amount of time in the sun as low SPFs and both must be reapplied every 2 hours as well as after swimming or sweating. Antioxidants Work With My Sunscreen for Increased Sun Protection FACT! Antioxidant serums, like our best-selling SkinCeuticals CE Ferulic, help to neutralize free radicals induced by UVA/UVB, infrared radiation (IRA), and ozone pollution - all which lead to premature aging in the form of wrinkles, brown spots, and loss of elasticity - bye bye collagen! When you layer a sunscreen over the top of an antioxidant you are providing maximum protection for your skin. A Base Tan Will Protect Me From Burning MYTH! A base tan can provide at most an SPF 4. So, if you normally burn within 15 minutes, an SPF 4 would give you an hour outside before you burn. We can’t think of any fun summer outdoor activities that take less than an hour to complete, so using your base tan as protection is a sure fire way to end up burnt. Your body creates melanin (the brown pigment in a tan) as a way to protect your DNA against radiation. So a tan is actually a stress response - your body’s way of telling you that you need to get out of the sun or at least slather on some sunscreen! Darker Skin Tones Don't Need Sunscreen MYTH! No matter where your complexion falls on the Fitzpatrick Skin Type scale, ultraviolet radiation (UV) light can damage your skin. Although it’s true that dark skinned people produce more melanin and, therefore, tend to have less sun damage than light skinned people, this does not mean they cannot develop skin cancer. Also, certain skin cancers are caused by other factors than UV such as genetics and environment and may occur on parts of the body that are rarely exposed to the sun. We recommend yearly skin cancer screenings to all of our patients, regardless of skin tone. Not all infrared is bad. FACT! Low level, partial spectrum infrared (IR) actually increases collagen leading to skin with less wrinkles and more elasticity. With the LED Poly treatment, we purposely use infrared light rays for their anti aging benefits. On the other hand, full spectrum IR can cause hyperpigmentation and damage the skin. This is why we love sunscreens like SkinMedica Total Defense and Repair - because they not only block UVA/UVB rays but also full spectrum IR. Neova DNA Damage Control is my pick because it's extremely water resistant. I wear it while running and it doesn't drip into my eyes. I've also NEVER had a sunburn when using this product and the formula actively repairs DNA while the sun is trying it's best to break it down." Why We Love It: Water resistant for up to 80 minutes, provides UVA/UVB plus antioxidant protection, Dr. Welsh’s go to for kiteboarding! Skin Types: All skin types! 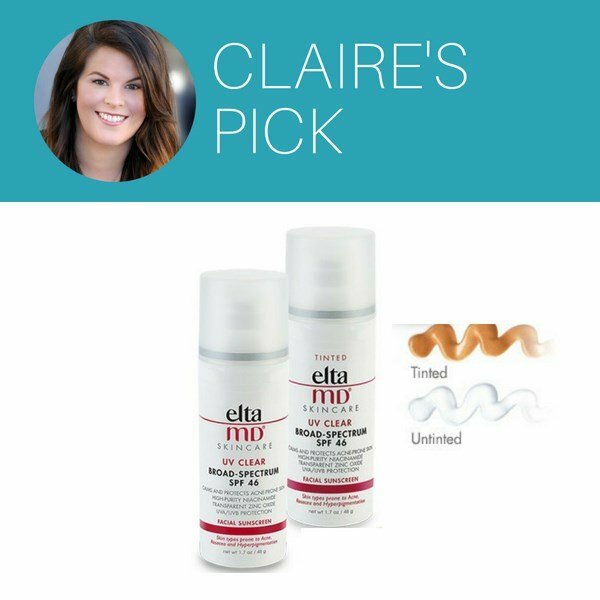 For everyday, Elta Clear Tinted is my go-to SPF. It's great for rosacea, isn't heavy and doesn't smell like sunscreen. 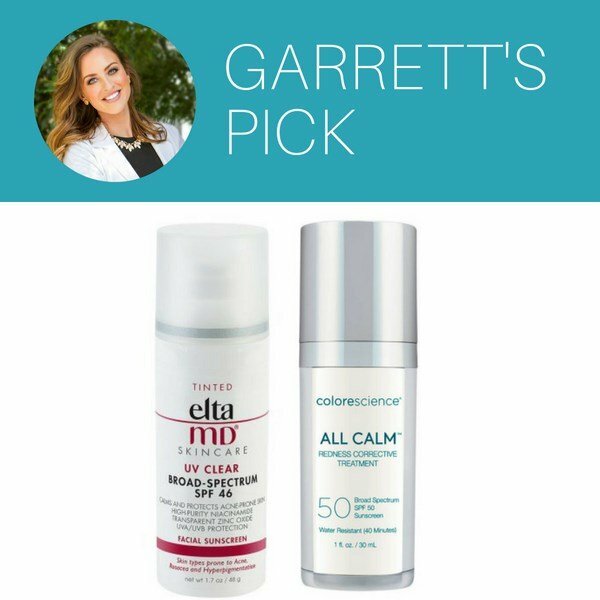 For daily wear or post-procedure, nothing beats All Calm for canceling out redness AND protecting my sensitive skin." Skin Types: Designed to be one shade that universally neutralizes red tones in skin. It is a corrective product that should be used based on skin concern (acne and rosacea) as a primer, rather than matching the skin color. 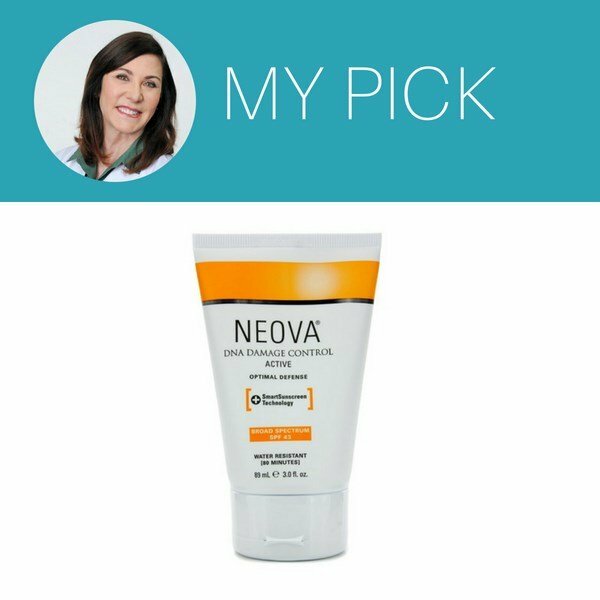 I've worked at BACD as an esthetician for over 8 years and know our patients with acne or sensitive skin are hesitant to apply sunscreen. That's why I feel so confident in recommending Elta MD UV Clear. I use it myself because it feels like nothing is on my skin and is a perfect makeup primer. The niacinimide in the formula also makes it an ideal partner to your acne regimen." Why We Love It: Lightweight, silky, and oil free. Calms the skin and redness with Niacinamide. Skin Types: Ideal for sensitive, as well as acne and rosacea prone skin. Available in both tinted and non-tinted formulas. As Product Manager and Makeup Consultant I test a LOT of products and I lean towards those that do double duty. So ColoreScience Sunforgettable Lip Shine is an easy favorite for me. We so often forget about protecting our lips! 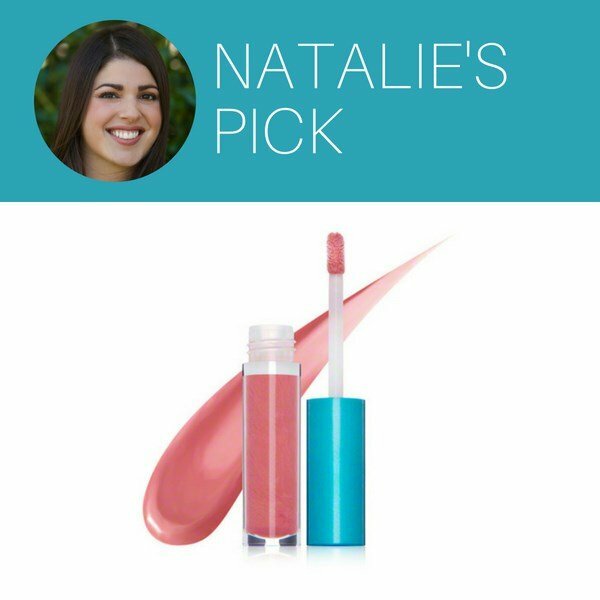 This gloss glides on and keeps my lips protected." Why We Love It: Beautiful, water resistant up to 40 minutes. One of the only suncreens that protects agains heat induced collagen damage, TDR from SkinMedica is hands down my favorite. It combines physical and chemical ingredients, giving broad spectrum coverage, and it it's one of few sunscreens that protects against Infrared light. I don't go out without it!" Why We Love It: Broad spectrum + infrared protection, contains antioxidant complex to rejuvenate skin. Skin Types:Available in both tinted and non-tinted formulas.